Join our email list and you could win lunch for two. Enter your email below and watch for winners each quarter! 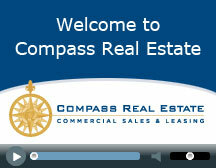 Compass Real Estate, led by Executive Vice President Patti Reynolds, was founded in 1991 as a full-service commercial real estate company specializing in matching tenants with ideal space for their businesses. It has been a pleasure working with Patti to complete our business negotiations and set up our store opening. Her commitment to seeing all the details through to completion has been outstanding. We look forward to doing terrific business at Meadowridge Business Park. Click here for a complete list of tenants.